Greg Lengyel was born on November 15, 1963. He was commissioned a 2d Lt in the U.S. Air Force through the Air Force ROTC Program at Texas A&M University on May 3, 1985, going on active duty on September 25, 1985. His first assignment was as a Satellite Officer with Headquarters U.S. Space Command at Peterson AFB, Colorado, from September 1985 to July 1987. Lengyel then went through Undergraduate Pilot Training for Helicopters at Fort Rucker, Alabama, earning his Pilot Wings in June 1988. He then served as a UH-1N Iroquois Evaluator Pilot with the 37th Aerospace Rescue and Recovery Squadron at Fairchild AFB, Washington, from June 1988 to June 1991. Capt Lengyel then attended the MH-53J Mission Pilot Qualification Course at Kirtland AFB, New Mexico, from July 1991 to April 1992, followed by service as an MH-53J Aircraft Commander with the 31st Special Operations Squadron at Osan AB, South Korea, from May 1992 to May 1993. He then served as Chief of Stan/Eval with the 20th Special Operations Squadron at Hurlburt Field, Florida, from June 1993 to June 1996. From June 1996 to June 1999, Maj Lengyel served with the 551st Special Operations Squadron and then 58th Operations Group at Kirtland AFB. He served as a Policy and Strategy Officer and then as an Executive Officer with Headquarters U.S. Special Operations Command at MacDill AFB, Florida, from July 1999 to June 2001. Col Lengyel served as Director of Operations and as an MH-53M Instructor Pilot with the 21st Special Operations Squadron at RAF Mildenhall, England, from July 2001 to July 2002, and then became Commander of the 21st SOS, where he served until June 2004. From June 2004 to July 2006, he served as a Military Assistant to the Secretary of Defense at the Pentagon, followed by service as a National Defense Fellow with the Brookings Institution in Washington, D.C., from July 2006 to June 2007. His next assignment was as Commander of the Combined Joint Special Operations Air Component at Balad Joint Base, Iraq, from July 2007 to July 2008. He then served as Special Assistant to the A3 with Headquarters Air Force Special Operations Command at Hurlburt Field and completed the CV-22 Osprey Senior Officer Qualification Course at Kirtland AFB. Col Lengyel served as Commander of the 1st Special Operations Wing at Hurlburt Field from November 2008 to June 2010. He served as Executive Officer to the Supreme Allied Commander Europe at NATO Headquarters in Mons, Belgium, from June 2010 to June 2012, and then as Commandant of Cadets at the U.S. Air Force Academy from June 2012 to July 2014. His current assignment is as Commander, Special Operations Command Europe, at Stuttgart-Vaihingen, Germany. Gen Lengyel is a Command Pilot with over 3,900 flying hours in the TH-55, UH-1H & N, TH-53A, MH-53J & M, CV-22B, Mi-17, PC-12, U-28A, and TG-16A. 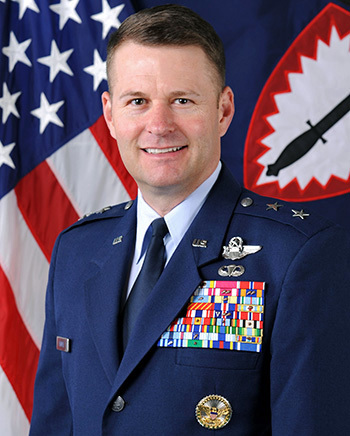 Lieutenant Colonel Gregory J. Lengyel distinguished himself by heroism while participating in aerial flight as Air Mission Commander, Rooster 23 Flight, 21st Special Operations Squadron, Joint Special Operations Air Detachment North at a classified location on 24 April 2003. On that date, Colonel Lengyel commanded a flight of four MH-53M helicopters tasked to extract 32 Navy SEALs and two desert patrol vehicles from a remote landing zone near Mukarayin Dam, Iraq, and insert them into Baghdad International Airport. Shortly after takeoff, his aircraft experienced a flight control malfunction limiting the movement of the flight controls. Colonel Lengyel evaluated the situation with the pilot and chose to continue the mission. Five miles west of Baghdad his missile warning system detected a missile launch and deployed flares in response to a confirmed surface to air missile launch. While the crew evaded the threat, Colonel Lengyel calmly collected data from the event and used long range radios to notify command and control authorities of the time and location of the missile engagement, and ensured that his second element would alter their route to avoid the danger area. After departing Baghdad, his aircraft impacted a large flock of birds breaking a large hole in the copilots window and severely reducing visibility through the front windscreen. His exceptional courage and leadership in flight while under repeated, direct, enemy fire were crucial to the successful mission accomplishment and safe return of all aircraft and airmen in his flight. The professional heroism and airmanship displayed by Colonel Lengyel reflect great credit upon himself and the United States Air Force.